The Nigerian National Petroleum Corporation (NNPC) says that the national average daily crude oil production stood at about 2.019 million barrels in 2018. 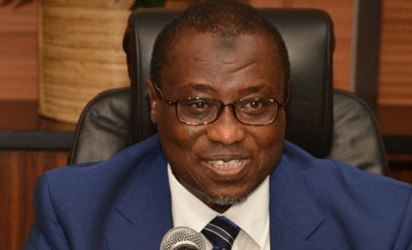 The NNPC Group Managing Director, Dr Maikanti Baru, disclosed this at the 12th International Conference of the Nigerian Association for Energy Economics (NAEE), in Abuja, on Monday.Baru reeled out some of the achievements of the corporation under his watch while presenting a keynote address as the guest speaker.He said that the volume of crude produced translated to an increase of 9 per cent above the 2017 average of 1.86 million barrels. According to him, it is a significant improvement from the unimpressive production level recorded on assumption of office in July, 2016. “To underline this, the Nigeria Petroleum Development Company (NPDC) in 2018 posted a production growth of 52 per cent compared to 2017 (i.e from an average of 108kbod in 2017 to 165kbod in 2018),” he said . On nationwide fuel supply , he said that the corporation established a petroleum products task force that helped it achieved steady supply of products accross the country.He said that a total of 1.2 billion litres was sold in 2018 as against 1.1 billion litres in 2017, representing seven per cent increase. “This was achieved through addition of 40 new affiliate and leased stations bringing the network to 618 stations nationwide. “NNPC Retail has also moved from loss making to profitability,” he added. On Joint Venture(JV) cash, Baru said that the corporation negotiated settlement of the Pre-2016 JV Cash Call Arrears and also championed indigenous cash exit/JV self-funding mechanism. “So far, we have repaid over 1.5 billionn dollars out of the 5.1 billion dollars cash call arrears to date, a development that has not only restored the confidence of International Oil Company JV partners, but has also led to improved reserves growth and crude oil production. “It was quite fulfilling that in 2018, that’s for the second year in a row, we concluded the fiscal year without any cash call arrears, he said . The GMD further noted that NNPC made remarkable inroads in frontier exploration within some inland basins of the country. He said topmost on this said was the Kolmani River-II Well which was inaugurated in February by President Muhammadu Buhari. ” So far, our operations, there are progressing satisfactorily, with drilling so far at over 10,000 feet with tremendous prospects,”he said . “There was also the Chad Basin which was halted by the security situation in the area. The Basin received new vigor with the successful Spud-In of Kolmani River Well II at an elaborate ceremony by President Muhammadu Buhari. On Gas Supply to Power In 2018, he said that the national average daily gas production stood at 7.90bscf. This, he said represented an increase of three per cent above 2017 average daily gas production of 7.67bscf. “Of the 7.90bscfd produced in 2018, an average of 3.32bscfd (42%) was supplied to the Export market, 2.5bscfd (32%) for Re-injection/Fuel Gas, 1.3bscfd (16%) was supplied to the domestic market and about 783mmscfd (10%) was flared. “Domestic gas supply capacity was marginally stable at about 1700mmscfd with an average of 1.3bscfd actually supplied to the domestic market,” he added He noted that of the 1.3bscfd supplied to the domestic market, an average of 761mmscfd was supplied to the power sector while 470mmscfd was supplied to the industries and the balance of 69mmscfd was delivered to the West African market through the West African Gas Pipeline (WAGP).